25 Days of Christmas continues with Rebekah Purdy! The search for the perfect Christmas can sometimes be more…eventful…than you think it would be! 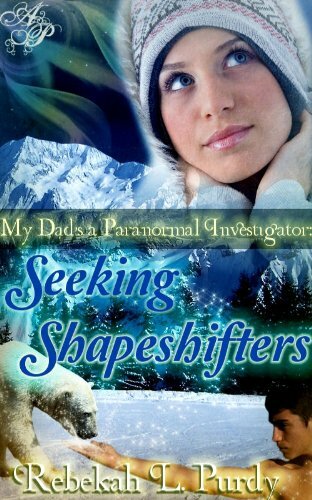 Don’t forget to leave a comment for a chance to win a copy of her YA paranormal romance novel My Dad’s a Paranormal Investigator: Seeking Shapeshifters! So I should start off by saying, we have a big family. I’m talking 6 kids big! Every December we load up into the Expedition to go cut down our tree. Imagine frigid temps, thigh deep snow, frozen appendages, 6 kids, and well, you get the idea. We traipse through the woods, looking for that perfect tree. And of course we all have a different idea of what size tree we’re searching for. A couple of years ago, I got it in my head that I wanted a really BIG tree. We have 14 ft ceilings in my living room, so I thought hey, why not go big. Er…big mistake (LOL). We spent several hours searching for said tree. Our feet were numb, it was getting dark, and all I kept picturing was the Griswolds out looking for their tree (you know the movie with Chevy Chase National Lampoon’s Christmas Vacation). At last, we found it and holy crap was it huge. It took all of us to get it tied down to the top of the truck. When we got home we had to move furniture out of the way so we could bring it in. We got pine needles everywhere, and the sap ugh! Then, it ended up being too tall (grr). So we had to cut some off the top. At last we got it stabilized and decorated it. A couple hours later, we were all downstairs when we heard a loud CRASH. Yep, you guessed it. The tree had tipped over (OMG). We hefted it back up and ended up having to put a large hook in the wall and tie rope around the trunk to keep it upright. But yeah it looked really pretty. Needless to say, we decided to downsize after that year. What about you? Do you have any traditions? Gotta love all the different traditions that people have for Christmas. And the fun part is that it seems like every family has at least one that's just a little bit weird. I LOVED, LOVED, LOVED the story, Rebekah. Christmas Vacation (the movie) is a tradition for us. It's funny, I just commented on this to someone else on my blog and here you are with the imagery. Lol. I stick to the fake trees as I'm allergic to pines but that doesn't make it less imposing to put the perfect Christmas tree up. Lol. Looneygrant and Traci,Thanks so much for stopping by! I love our family traditions! Another one is that we go to Bronner's Christmas store in Frankenmuth every year and let the kids each pick out a new ornament. Totally fun. And TONS of ornaments to choose from.And Traci, I love that movie, it always makes me laugh. I keep telling my hubby I want to put Christmas lights all over my house like in the movie (heheheh). Kit,LOL, I know, I love cousin Eddie, even if he's really sick (heheh). And Clark's aunt who puts cat food on the jello. Luckily, I don't have any relatives like that coming over…Thanks for coming by! Jenn,Thanks so much for dropping in! I LOVE the lights too. We don't have all traditonal ornaments either. When we take the kids to pick out ornaments we normally get quite an array of "themes". We've got Irish stuff on the tree, medieval, light houses, animals, musical things, crystal, hunting themes (don't ask–LOL). But it's fun. And we don't do the garland anymore either, just the lights and some decorations. Very funny, Rebekah. We have a similar situation every year traipsing around looking for "the" tree–somebody always ends up in tears because we didn't pick the tree they wanted. We also always go too tall–we haven't been able to have a tree topper in years because there's no room. There is, however, a sap stain on the ceiling in that corner! My dad always did it the easy way and we liked it. Went to one of those road side places that sell Christmas trees. Like you we had a tall ceiling so the tree had to be tall to match the height. At least it never fell over.Your story does sound interesting. ROTFL!! Hilarious, Rebekah! I remember finding all those pine needles through the summer after Christmas. Yeesh. Even though I live in Michigan (where LOTS of tree farms are) I have a fake-o. Easier! Great story, Rebekah! Our holiday mishaps usually center around food. Too much, too little, too burned, too raw, etc. But they're all special – that's why we keep celebrating them! My family and I watched this movie not that long ago! I think that is soooo funny that you guys actually did that! :)You don't have to enter me in the giveaway. I've already read your book and it was fabulous. 🙂 Have a great holiday. Meg,I live in Michigan too! Woohoo…LOL and OMG, yes we find pine needles way after the fact too (poking into my socks). So glad you could stop in!Patricia,LOL–I can totally relate to the food thing, I totally CAN'T cook. My hubby does most of it (yeah, I'm the one who accidentally broiled a frozen pizza–so not good).Thanks for visiting! Felicia,Hey girl–thanks for dropping in! I LOVE that movie. It's so funny…and I swear every year when we watch it, it reminds me of my family (minus the crazy cousins–LOL).Sherry,One of my critique partners lives in the UK (East Sussex). I took a trip there a couple of years ago and it's absolutely lovely! Although, London was SO huge–LOL. It took me a bit to figure out the bus system. Thanks so much for stopping by, so good to have you. Sorry I'm drawing the contest a little later than I intended, but the winner of My Dad's a Paranormal Investigator: Seeking Shapeshifters is…Tess Grant! Tess, please get your email to me and I will send you your prize! You can email me at brea(at)breaessex(dot)com if you prefer to not post it on here. Congratulations! Thanks, Rebekah and Brea. I'm really excited. 25 Days of Christmas: Secret Santa by Kristine Cheney-Free First Chapter and Giveaway!